10/29 -- Thursday. Pack out and leave Buenos Aires at about 6AM. Arrive Tucson about 8AM. Empty tanks, refill gas tank. 8.3 mpg for the trip. Unpack at home, drive rig to storage lot. Uber back home at about 9:30. Remarks: I left camp earlier than I'd intended. Restless night's sleep, and at 5:15 I woke up to the sound of a big diesel right next to me. A couple of deer hunters, who'd scouted "my" site a few days earlier and were not happy someone else was there. They were much happier when I told them I'd be out in less than an hour. Apparently the whitetail season begins now, and the good spots in the part of the refuge which allows hunting will get full for a while. I lucked out. I'll echo what I said a couple of days ago. In spite of the fact that I'm getting pretty efficient at packing and unpacking, there's a pretty high overhead going out for just a couple of nights. And I'm not sure that this spot is worth more than a couple of days without some specific reason to be there. In all, though, a good trip. My next voyage will be by plane and rental car next week,visiting family in Boulder CO. So blog activity will taper off again. 10/26 — Monday. Food shopping. Moved RV to parking lot across the street. Turned on refrigerator. 10/27 — Tuesday. Shuttled car back home (Uber.) Checked fridge: at temperature. Packed food, clothing, utensils into rig. Loaded dog into rig. To Merrigan’s RV service, dumped holding tanks, filled fresh water. To Discount Tire for pressure checks. Leave Tucson. Arrive Buenos Aires about 1:30 pm. The site I’d hoped for was vacant: #73, on access road across from entrance road to refuge hq. Sunny and warm. Big vistas. Solitude. Silence. Partly cloudy Wednesday, but solar panel is keeping the batteries topped off. Rain forecast for late tonight and tomorrow morning. At this point I plan to leave Thursday morning. It’s being a good interlude, but I’m not sure a trip this length is worth all the hassle of packing and unpacking. I had the guys at SoundFX here in Tucson rewire the power to the radio so I wouldn't be draining the starter battery when I listen to music in camp. I was happy to have someone who knew what they were doing make the connections to the rig's power distribution center. What a difference! It sounds great -- the speakers went in the coach area; I'm keeping the existing front door speakers for now. This supports Siri Eyes-Free technology, so I can make and receive phone calls without losing eye contact with the road. Plus it plays music off my iPhone. Tunes as I travel! Yes! This blog has been pretty inactive lately -- the last post was about two months ago, after I got back from my last longish trip. I was really touched when one of you sent me a message to ask if I was OK. I am! When I got back to Tucson, I jumped into some house maintenance projects which I'd put off: repainting a couple of rooms and getting rid of stuff I simply wasn't using. There was maintenance work to be done on the Beast as well: I had my mechanic investigate the warning light situation which had cropped up on my way into White Rock. The misfires on a couple of cylinders were cured by replacing injector wiring harnesses. The clunking sound when the driver's window was open and closed required a new window motor assemble. 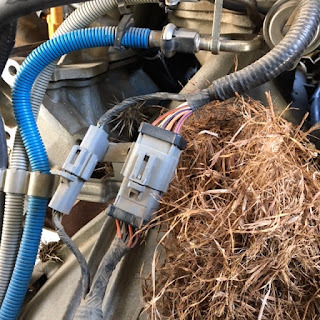 And yet another pack rat nest was discovered, deep inside. Photo attached. At least they didn't eat any of the wires! So, after a deep breath and a big check, all is well again. I think. I also made some progress on a problem which has been nagging at me for a while. The ceiling of the Beast is covered in a fabric which resembles a very short-pile carpet. It had stains from some roof leaks which have since been attended to, but the stains were unsightly. So I hauled my trusty Bissell spot cleaner (acquired to deal with pet stains on the carpet at home) down to the storage lot and used it on the stained areas. Bingo! It's a small thing, I suppose, but it gave me pleasure. I've also been considering what to do with the radio/stereo in the Beast. It may have been original equipment (in 1999!) and has a cassette deck. Not, to say the least, current technology. It drives speakers in the cab area, the "coach" area, and a couple of exterior speakers which I've never used. I pulled one of the coach speakers out of its housing and it was shot... the cone had pretty much detached from the housing. The dash installation wasn't standard, to say the least: I think perhaps the RV manufacturer had replaced the Ford original. I started to research replacement stereo, and while I was doing that, my car radio up and quit on me! Long story short: I've discovered Crutchfield as an online source of car stereo gear. I was probably the last on my block to learn about them. I'm replacing the stereo in the car this week, and if that goes well, I'll consider the more complex problems of the RV system. It would be good to have some better quality sound in there. Next trip, I think: a short trip down to a couple of southern Arizona places I like. Probably about a week. That may generate a little more activity here on the much-neglected blog.